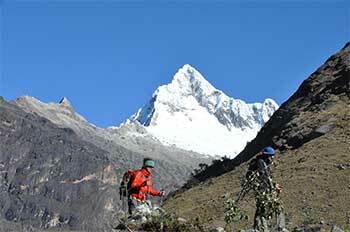 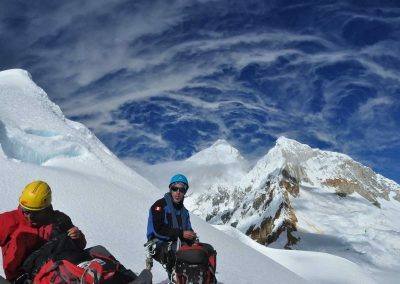 The Cordillera Blanca range located in the north of Peru, has a tremendous concentration of 6000m peaks. 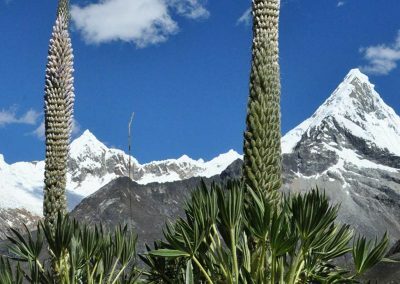 The mountains run roughly north to south and are easily accessible from the Callejon de Huaylas (Huaylas Valley), which lies to their west. 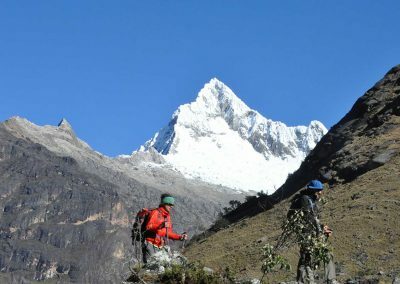 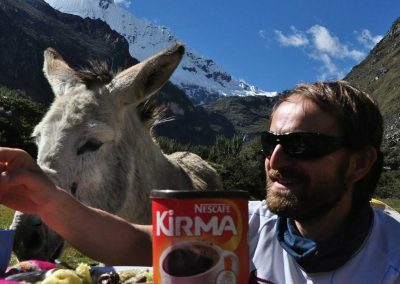 In 1975, the Cordillera Blanca or Yurak Janka (in the Quechua language), “The highest tropical mountain range in the world”, was declared Huascaran National Park. 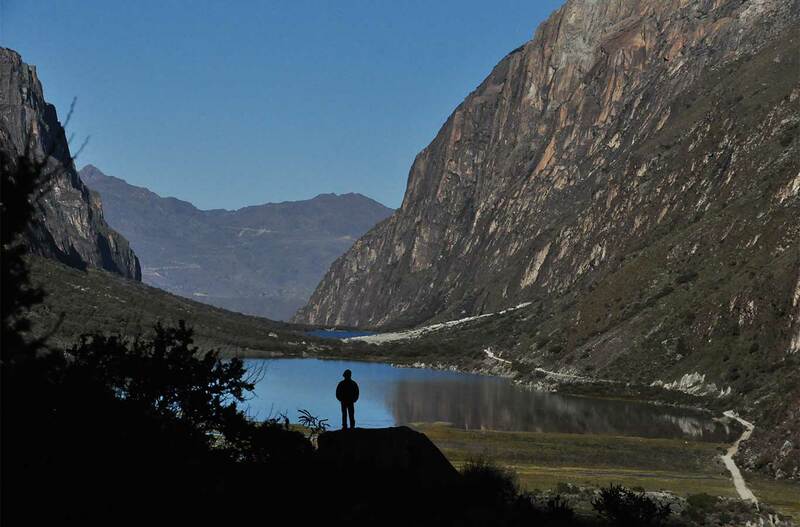 In 1977 and 1985 UNESCO declared this protected area as “Biosphere Reserve” and “Natural Heritage” respectively. 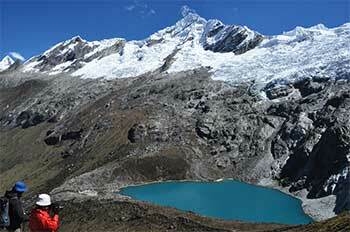 Between the dramatic peaks of the Cordillera Blanca the valleys are dotted with stunning turquoise glacial lakes. 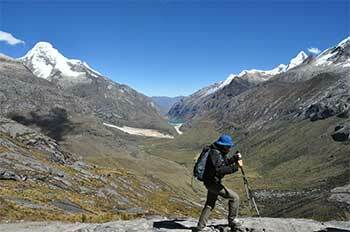 Most treks follow these valleys, which run west to east through the mountains. 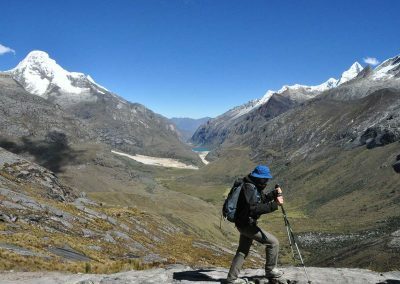 Among these mountains and valleys is where most of the adventure travel and tours in the Peruvian Andes and in the Cordillera de los Andes in South America take place. 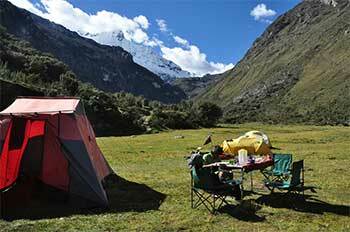 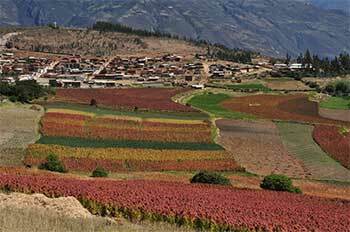 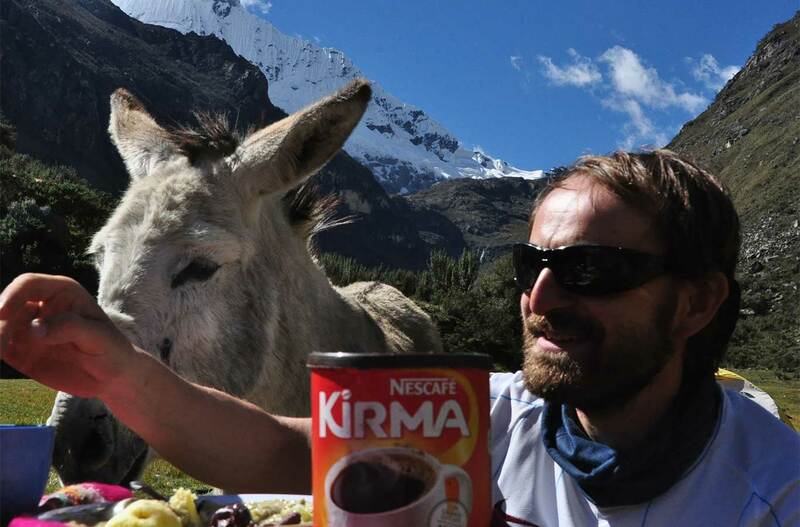 Transfer to Cashapampa village and Trekking to camp 1 at Llamacorral in a meadow at 3700mt. 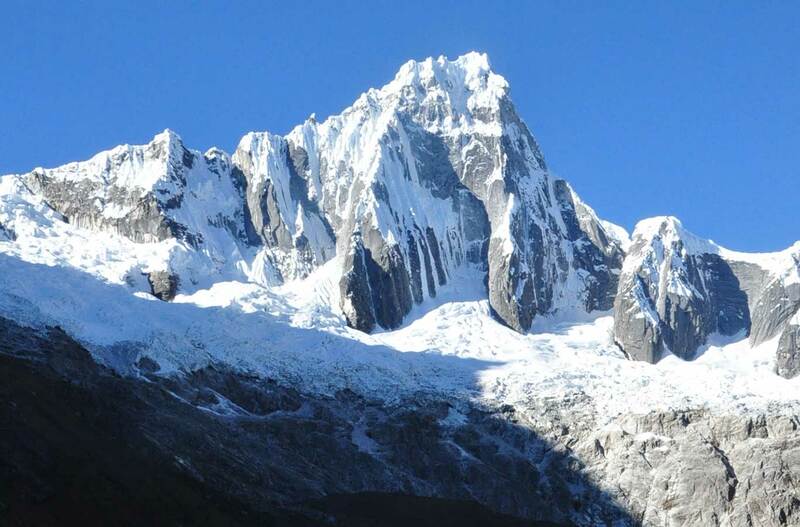 After breakfast we will walk along Quebrada Sta. 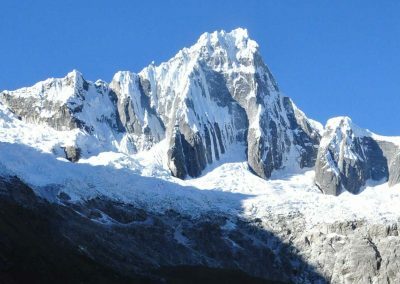 Cruz. 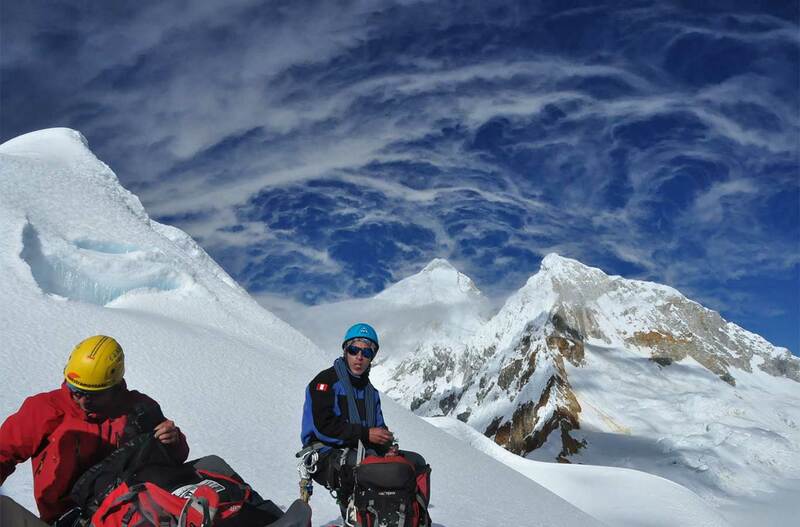 Watching impressive peaks like Quitaraju-Alpamayo- Artesonraju, etc. 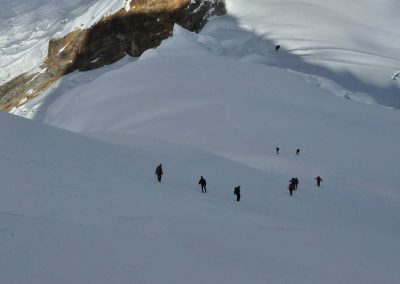 till we arrive to camp 2 at Taullipampa 4250mt. 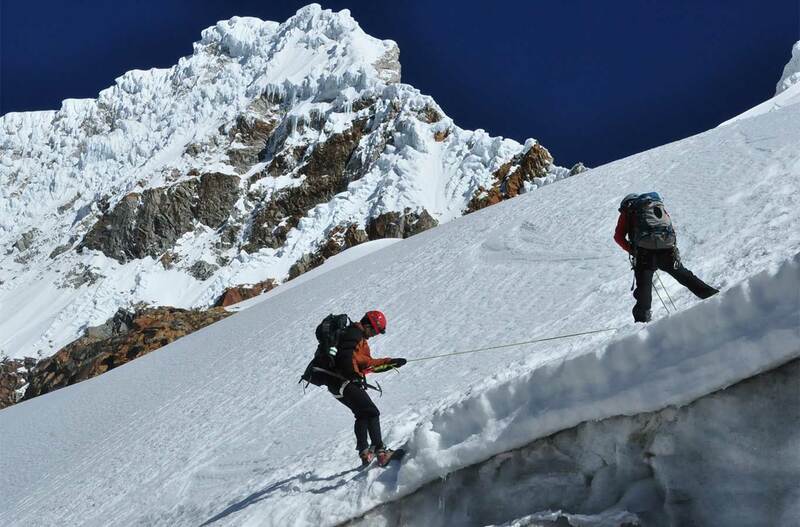 Today we will carry on uphill towards Punta Union 4759mt. 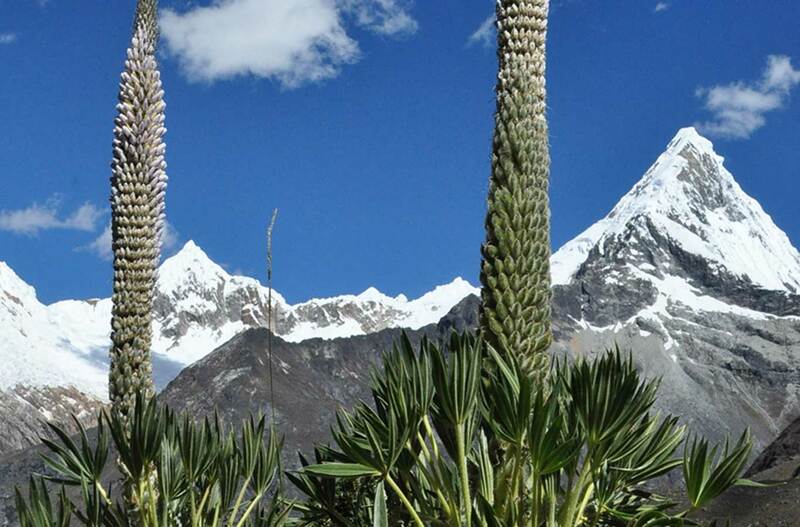 Georges views of Huascaran-Chopicalqui- Taullaraju etc. 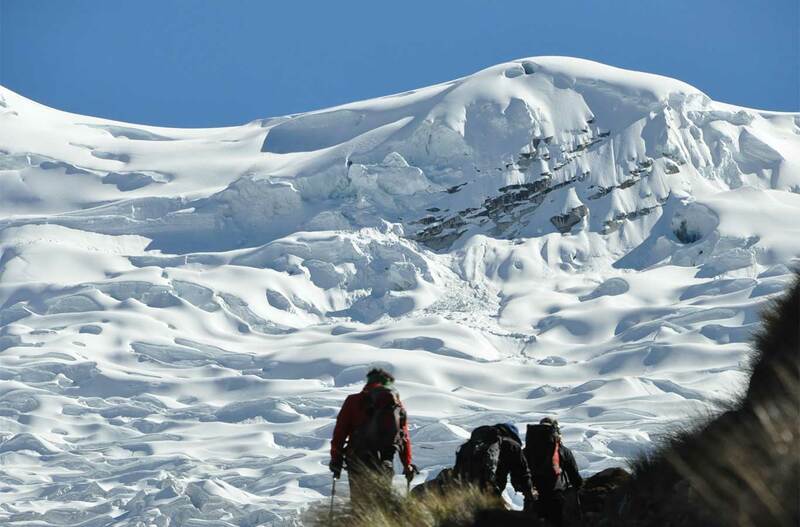 Afterwards we will descend to camp 3 at Cachinapampa 3745mt. 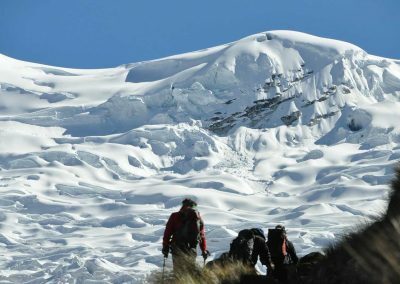 After breakfast we will walk down hill along the some indian communities such as Huaripampa and Vaqueria, and finally we will go up hill till we arrive to camp 4 at Paccha meadow. 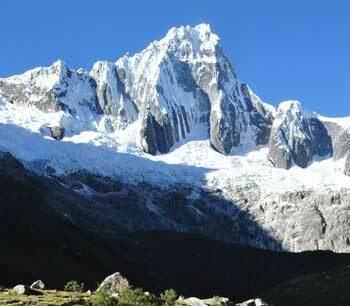 Today we will reach Potrachuelo Pass at 4767mt. 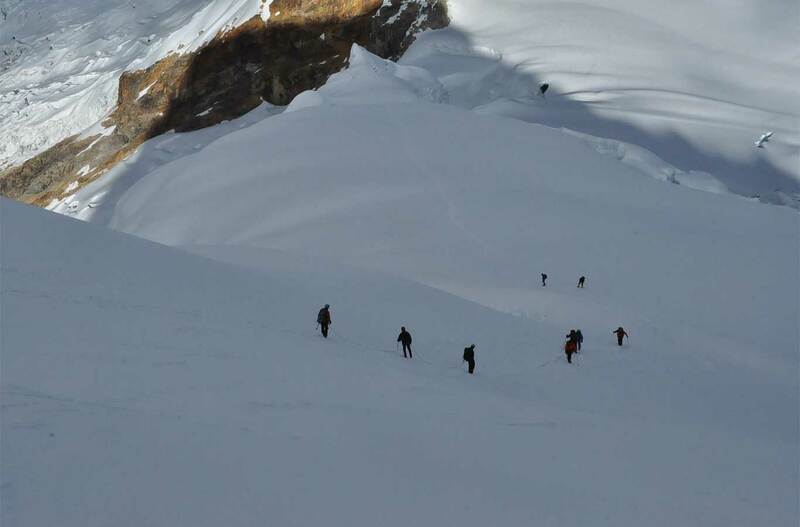 and descend to our 5 camp in Cebollapampa at 3850mt. 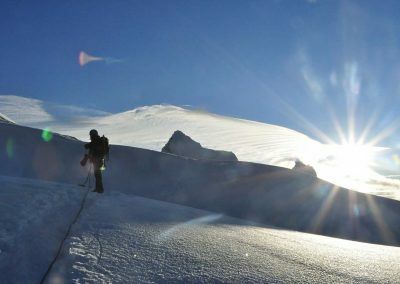 We will have a late breakfast and carry on towards the PERU Hut at 4800mt. 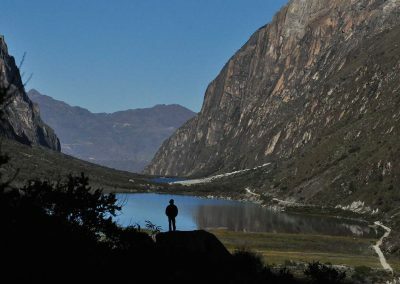 where we wil prepare for the midnight depart towards PISCO Summit. 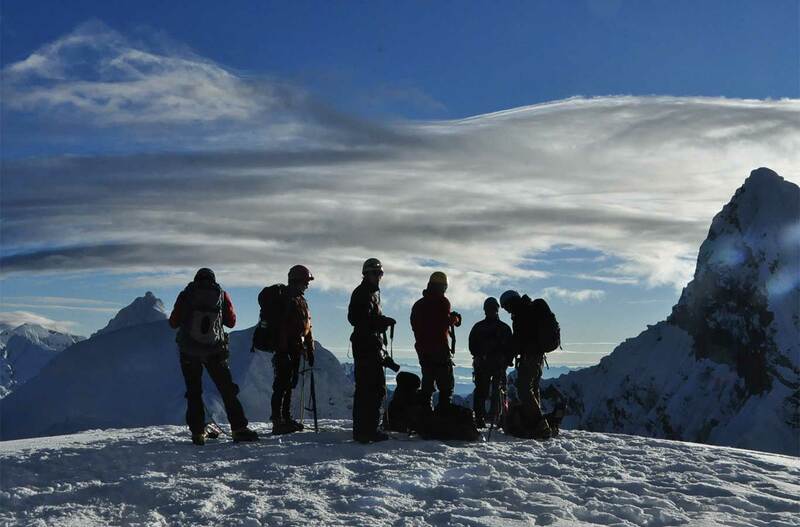 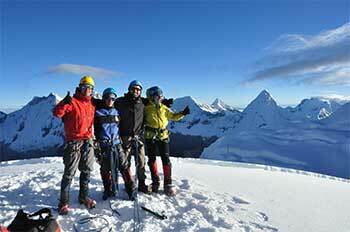 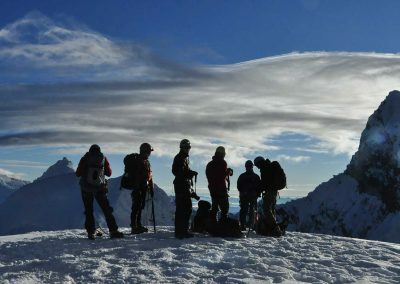 We will wake up at 01h00 and get ready for the summit, we will head to the col Huandoy/Pisco 5450mt. 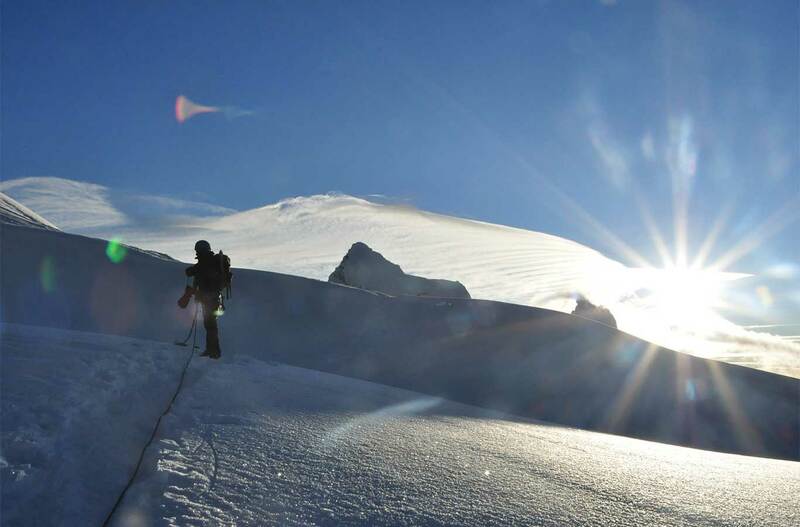 and head to the ridge, fording some crevasses till we get the final pitch to the summit 5760mt. 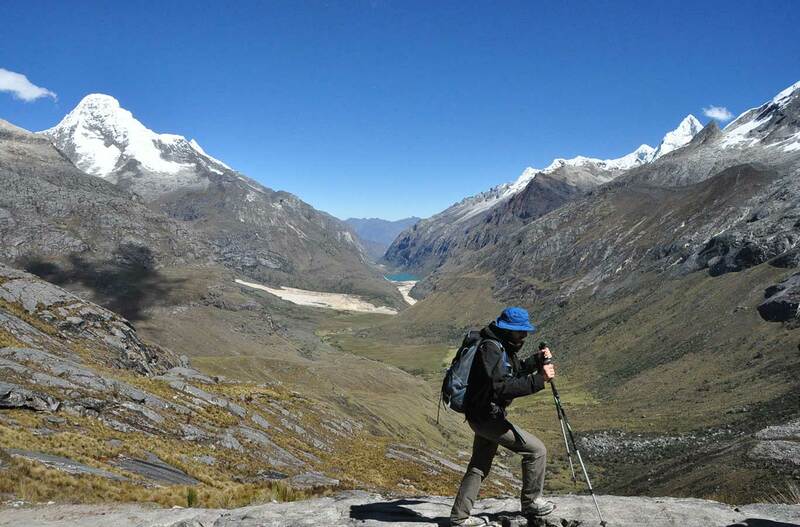 Fantastic views of the Cordillera Blanca and the most important peaks will be observed, down hill to the Hut, for relax, packing and back to Cebollapampa where the bus is waiting to drive back to Huaraz.